Red Fruits 10ml. It’s a mystery. Red berries, followed by very black grape to be overtaken by sweet eucalyptus with hint of menthol and covered with anise. 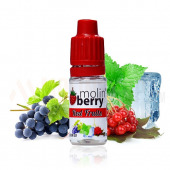 Red Fruits 10ml. It’s a mystery. Red berries, followed by very black grape to be overtaken by sweet eucalyptus with hint of menthol and covered with anise. Lush variety of flavors once inhale & exhale. The mystery is waiting to be discovered. Recommend dosage: 5-6%. Bottle 10ml made from PET material, childproof cap, long, thin dropper. Produced in EU.